A professor’s donation goes towards an open-air classroom meant to encourage dialogue without distraction. A new classroom at Royal Roads University relies more on fresh air than an audiovisual system to keep its students focused and attentive. 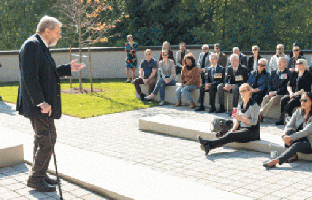 The Terry Power Strategic and Advanced International Studies Outdoor Classroom was officially opened on October 12 and can accommodate up to 50 students in an open-air learning space on campus surrounded by trees. Dr. Power gives a lecture outside. Photo courtesy of Royal Roads University. The Royal Roads outdoor classroom officially opened on October 12, 2018. Photo courtesy of Royal Roads University. While outdoor classrooms are gaining in popularity at the elementary school level, it is still fairly rare at universities, at least outside of outdoor-related disciplines. McMaster University opened an outdoor learning space in 2016. The Indigenous Circle was created in collaboration with McMaster’s Indigenous Education Council and is managed by the Indigenous studies program. At McMaster, the “goals of the space are to encourage learning outside of the classroom, to encourage the indigenous community to have a space that we can call our own within the university, but that is also available to all faculty members, all students on campus,” says Vanessa Watts, director of McMaster’s Indigenous studies program.